July 14 is annual celebration of Bastille Day in France and French dependencies. 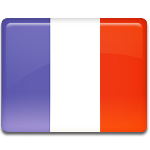 This name was given to the French National Day, while in France it's called La Fête nationale (The National Celebration) or Le quatorze juillet (the fourteenth of July). The first celebration of Bastille Day took place on July 14, 1790 (at that time the holiday was called Fête de la Fédération — Festival of Federation) and it commemorated the beginning of French Revolution and the storming of Bastille in 1789. The celebration featuring a parade was held nationwide, making it the oldest and largest military parade in Europe. The festival was forgotten for almost a century and revived in 1879, when a semi-official feast was organized in Paris. Bastille Day was officially recognized on May 21, 1880, when Benjamin Raspail proposed a law to chose July 14 as a yearly national holiday. There were debates over the date of the holiday (July 14 or August 4 – the day when the feudal system ended in France), but Senate approved July 14. Bastille Day Military Parade has been held in Paris every morning on July 14 since 1880. Previously the parade was held anywhere within or near Paris, but the Champs-Élysées has become its official place in 1918. The military parade is a very popular event in France, that is broadcasted on French TV. In some years foreign troops also participated in the parade.